Imagine if you could learn by replaying lectures in your sleep instead of studying during the daytime! 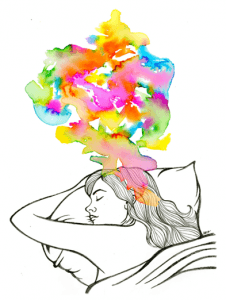 This idea, often referred to as hypnopedia, is a hypothetical means of learning during a period of sleep. Recently, Philippe Peigeneux, a noted faculty member of the Université libre de Bruxelles, led a study investigating how much young adolescents can learn during sleep. This idea of hypnopedia was first universalized during the mid-twentieth century, thanks in part to Aldous Huxley’s Brave New World. In previous tests, scientists found connections between odor and respiratory refluxes to tritones (a set of three musical notes) induced during the sleep of young adults. However, there have not been any data-driven correlations between sleep induced memory and compound learning skills such as word retention. While researchers have yet to test the brainwashing and sleep-teaching methods used by Huxley’s controllers, the chances of such learning seem slim according to Peigneux and his studies. Peigneux’s study was conducted on twenty-two young adults, ten of whom were used as controls because they did not properly enter the Non-Rapid Eye Movement (NREM) sleep state during study inclusion trials. NREM sleep occurs in the beginning of a typical sleep cycle and is the precursor to the important REM sleep stage. In the study, Peigneux’s team utilized magnetoencephalography (MEG) to track brain activity and stimulation during both periods of sleep and wakefulness. Statistical (STAT) and random (RDM) tritones were presented during sleep. Researchers failed to find a significant correlation between the STAT streams during NREM sleep and wakefulness even though the MEG data showed cerebral feedback during the tritones. Peigneux’ study concluded that the brain does not make associations between rather complex stimulus-stimulus during periods of NREM sleep. While Peigneux’ study gave an endpoint to intricate learning during NREM sleep, there is still a chance that humans have the ability to earn during sleep. Future studies will include testing hypnopedia, a period of rapid activity in the brain, during REM sleep.